Cala Mia offers a fully equipped Dive facility, so you can enjoy day diving adventures in Panama. We are an environmentally friendly dive operation and have a “no touch” policy on all dives. Many of the best Panama Dive Sites are located in the Gulf of Chiriqui. The Marine National Park is home to dozens of pristine islands and unspoiled beaches. The resort is only 20 mins from the National Marine Park, one of the richest and most abundant eco-regions in the world. We are also happy to announce that we are a Naui Dream Destination. The marine park has over 800 species of tropical fish and 33 species of sharks. Our dive sites range from calm inshore reefs to exposed deep water pinnacles and wall dives. Isla Secas is located on a chain of sixteen volcanic islands 18 miles from the Resort and features excellent diving with clear waters and a variety of marine life. 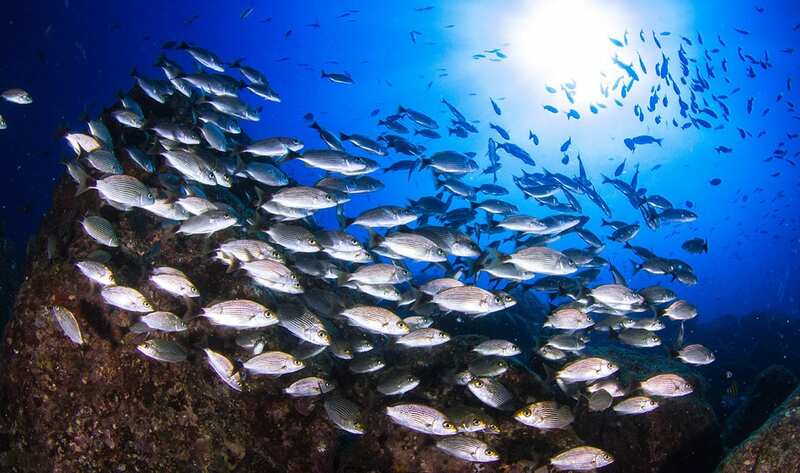 Isla Ladrones has a concentration of fish life that is stunning and diverse and divers will see schools of jack, barracuda and snapper regularly. The Coiba Island is described as the “New Galapagos” and offers some of the best diving in Panama. The island’s diverse wildlife includes dolphins, humpback whales, manta rays, barracudas, whale sharks and tiger sharks, and much more. Coiba island diving is something you’ll never forget. We are happy to announce that we are a Naui Dream Destination!